Easy Week Night Dinners with Spice! This week I have been having a play with some beautiful organic spices from Gourmet Organic Herbs. I love using a spice blend when I cook. It’s a really easy way to add flavour to your meals without the need for a million spices in your cupboard or complicated recipes. Just choose the flavour you want and go for it. Rubbing the spice blends on meat and grilling is one of the easiest dinners we often do. Knock together a quick salad while the meat is cooking and bam – dinner! Simple and quick but also tasty and healthy and quite gourmet. I also find buying the spice blends in small quantities much better, because spice does have an expiry date and rancid spice is quite yucky!! The Gourmet Organic Herbs ones come in small plastic bags, with a resealable tab. So you can store them like that or transfer to a glass jar. 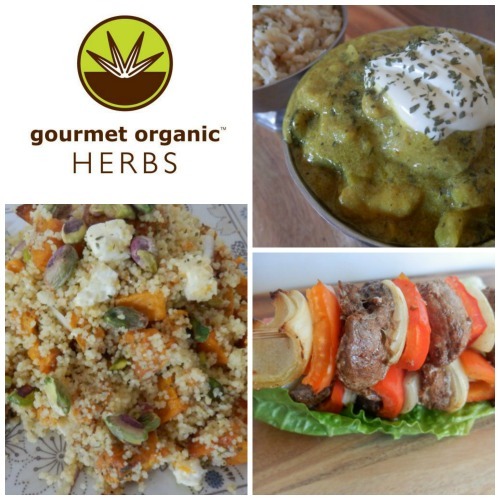 These are some simple dinners I made this week using the Gourmet Organic Herbs spice blends. The family was impressed! 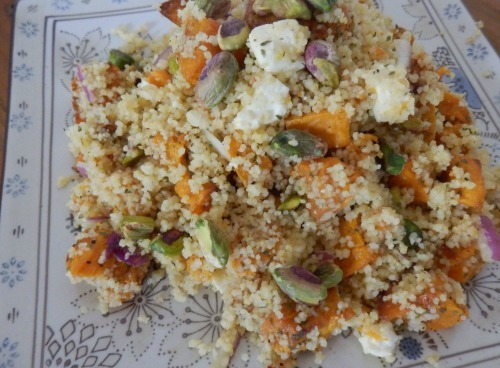 Put the couscous into a heatproof bowl. Pour over the water. Leave for five mintues and then fluff with a fork. Add the remaining ingredients and toss gently. Serves 2. Heat the coconut oil in a deep, large frypan on a medium to high heat. Add the onion and garlic and saute until translucent. 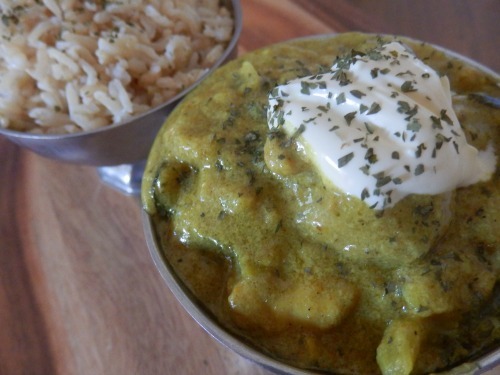 Add the Gourmet Organic Herbs Indian Curry Spice Blend and cook for one minute until the aromas are released. Add the chicken and brown off. Add the vegetables and the chicken stock. Cook for twenty minutes or so until the chicken is cooked through and the vegetables tender. Lower the heat and stir through the coconut cream. Serves 4. Soak ten bamboo skewers in water for at least half an hour. Mix the pork in a bowl with the Gourmet Organic Herbs Mexican Spice Blend. Cut the onion and capsicum into a large dice, similar in size to your pork. 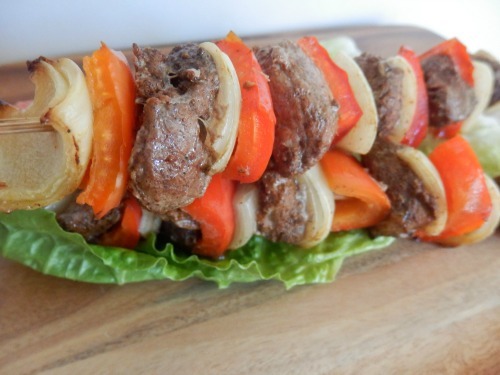 Thread the pork, onion and capsicum onto the skewers. Drizzle with a little macadamia oil. Cook under a hot grill for about 4 minutes either side or cook or on the barbecue. Serve with a simple green salad dressed with olive oil and lime juice. Serves 4-5. Anabel and Hollan are the young Aussie family behind Gourmet Organic Herbs. Anabel has a background in hospitality and Hollan is a herbalist, so to say they have a good understanding of herbs and spices is an understatement! They source the best quality organic herbs and spices and blend with care. Minimal processing is their aim, to retain the precious essential oils in the herbs and spices. They also sell a range of organic mustards, dressings and vinegars. Where do you find them? As well as buying the range direct from Anabel and Hollan online, you can also find the range in selected health food stores, gourmet delis and organic markets. I am a fan. It’s quite difficult to find good quality certified organic herbs and spices in Australia, so it’s nice to know there is a one-stop shop when I need to source something. Being organic, the range is naturally free of GMO as well. Spice blends from the supermarket are notoriously full of salt, sugar, preservatives, additives and fillers like wheat! These are just 100% spice and herbs. No nasties hidden in there at all and the range is totally gluten-free. Lastly, but maybe most importantly, is the flavour! It was there in spades. We all really loved the authentic taste of the blends. You only need to use a small amount, which is a testament to the great quality. 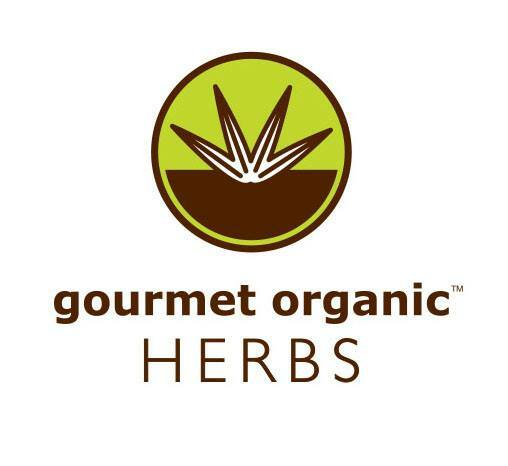 Check out the Gourmet Organic Herbs facebook page. Anabel and Hollan often put up some amazing recipes, giveaways and special offers for their fans. It’s really nice to see that this small family owned business has grown and expanded so much. My verdict? Amazing products, give them a go. Do you use spice blends? Got any tips for us? Will definitely be trying these recipes, yum! Thanks Sonia – haven’t come across these before! YUM! sensational recipes .. thank you for sharing. I love these spice and herbs from this company .. I think they are awesome! I have quite a few in my pantry .. and think the quality is great.